beans | eat. drink. cook. travel. I’d probably be lynched by fans of Big D’s (including the friend who told me about it) when I say that I think the food is expensive. It could well be that the chef buys nothing but the best cuts and uses the best ingredients. It could also be that the chef doesn’t have enough bulk to warrant good prices from his suppliers. I found it a little disconcerting to pay restaurant prices for something at a coffee shop stall. Nonetheless, the food was very good. DC and I shared a kurobuta pork chop ($28) and an anchovy pasta ($17). I liked how the pork was charred outside and just about done on the inside, with a smidgen of pink right in the centre of the cut. It was strangely difficult to cut (no steak knives here) but was just the right firmness I expected – slight give from the marbling of fat and good heft in the mouth. Plus, it had good porky flavour. The accompaniments were passable. 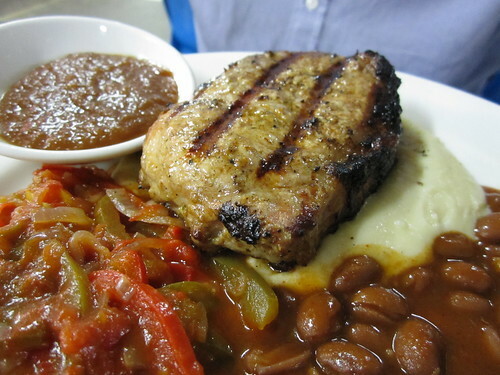 I liked the slow-cooked peppers and surprisingly, also the baked beans. They were quite different from the canned version and are something like American Southern beans. Pretty yummy. I’m on the fence on the strange sweet accompanying sauce (pineapple?) but DC didn’t mind it at all. I didn’t like the overly starchy mashed potatoes, and DC didn’t appreciate the stall telling him that he couldn’t change the mash to french fries because they “wouldn’t go.” Well, overly starchy mash doesn’t go with anything in my books. 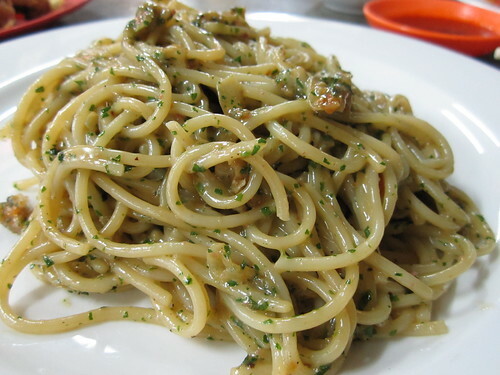 I liked the anchovy pasta. The spaghetti was on the verge of soft that was still acceptable, though I’d have preferred it more al dente. I suppose they cater more to the popular taste for soft noodles. The anchovy sauce was punchy, robust and of course redolent of anchovies. A bit of chilli added some kick to it. However, I think it’s not quite worth the price as anchovies aren’t that expensive. My plate only had a smallish heap of sauced pasta on it and nothing else. Sure, I’d only ordered just that but it’s a tad pricey no? Plus, I really ought to banish the thought but seeing as I could tweak the idea further at home and add all sorts of lovelies to it for half the price, I was slightly dismayed. It was still good though! Stir-frying is actually quite simple, as long as you’re quite brave too! Most home cooks only do it on medium heat, resulting in food that’s more steamed than fried. Stir-frying requires a very hot wok and all the ingredients, in small quantities, on the ready. This makes sure that the food is fried quickly and you get that barely charred taste. Here’s how to do it. First, heat a dry wok till very hot. Then add the oil, swirling to coat most of the wok. Wait till the oil starts to shimmer and barely smoke. Make sure the ingredients are ready. Add the aromatics, like chopped garlic, and stir like mad. When it’s fragrant, add the rest of your ingredients according to how long they take to cook, and keep stirring. Turn off the flame and then season. Toast the belachan in a dry wok until brown on both sides. Crush using a mortar and pestle. Add oil to the hot wok and when oil is shimmering, add the shallots and fry till fragrant. Toss in the chilli padi, belachan and kang kong and fry till kang kong turns deep green. Heat the wok and the oil till oil shimmers, then add the garlic. Fry till fragrant. Add the tau kwa and fry till tau kwa is browned but not burnt. Add the watercress and tau cheow and fry till the veg turns deep green. Heat the wok and the oil till shimmering. Add the mushrooms and fry till browned. Add the chicken and fry till browned slightly on all sides. Now add the french beans and fry for a few seconds. Add the shaoxing wine and stir till it stops bubbling, then turn off the heat. Add salt to taste. Not being too satisfied with Tampopo, I persuaded Shinta, KK and Eeyore to eat at Miharu the next day. (Don’t ask me why they have these pseudonyms, I didn’t choose them.) As is typical when eating with Shinta, we had a steady stream of appetisers. The stir-fried beans were excellent. The beans were crisp-tender and just cooked through, the way perfect beans should be; and the thickened mince meat sauce was a great complement. Shinta gobbled up the last bits of meat and I wiped out the beans. The gyoza was so-so. It wasn’t as crisp as I’d like despite the picture and the filling wasn’t very tasty either. We half-coerced Eeyore to finish the last one. I liked the braised belly pork with mustard. They used an extra-strong mustard that cut through the fat as well as the salty-sweet braising liquid. The pork was soft enough for me though not up to standard for Shinta and KK, who’d just got back from another trip to Japan. Moving on to the ramen, I ordered the spicy version. I guess it was some kind of misguided attempt for consistency between my earlier Tampopo experience and here. At Miharu, they serve it Sapporo-style, so I really should have ordered the miso without chilli. Never mind. This version was decent. It was topped with chashu, menma (marinated bamboo shoots), sweetcorn, spring onions, half an egg and piece of seaweed. All was fine: I especially liked the texture and sweetness of the corn though I’d prefer the egg to have a runnier yolk. The noodles were quite heavy, though still springy and tender. I can imagine how good it’ll be to come in out of the Hokkaido snow for a big bowl of this stuff but it didn’t work as well in hot humid Singapore. It was also on the day it was 35 ºC! The soup was, as expected from online reviews, a bit on the salty side. The restaurant provides plenty of cold tap water and, on request, gives out stock to tone down the salt. I liked the soup but would probably need to come back another day to try it without the overpowering chilli. It was just an unnecessary distraction that didn’t add much to the ramen. Unfortunately, this ramen wasn’t good enough for me to finish either.